Eight points from Barry Molloy and a goal from Derek McNamara helped Ardclough claim their first win of this year’s Senior Football League on their home patch. Having been beaten by Castlemitchel on the opening day, Ardclough bounced back and were by far the better outfit in the second half. Ardclough took the lead in the first half after 5 minutes. 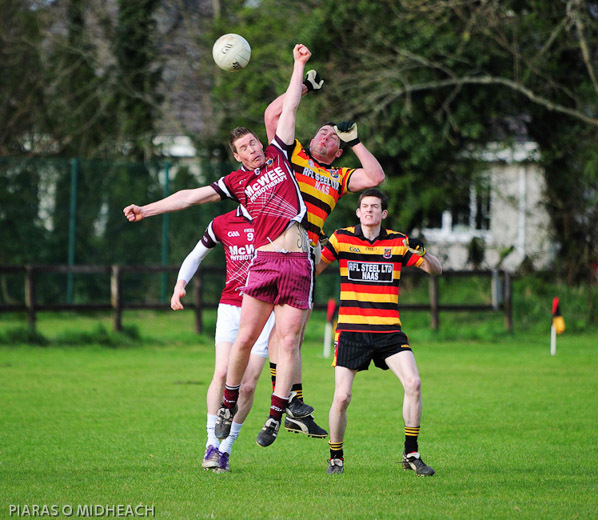 Barry Molloy was involved in much of Ardclough’s attacking play and notched up 3 points in 12 minutes. The sides were even at eight points a piece at the break. The hosts started to take over in the second half and attacking runs from Andrew Conway and Colm Buggy caused Ballykelly problems, as was the aerial ability of Stephen Kirwan. Ger Cullen was exposing gaps in the Ballykelly defence throughout the game and his long range pass found Derek McNamara lurking around the square, who burst his shot past keeper Darren Fogarty. Conway was in fine kicking form again. One of his runs down the canal-side resulted in a great score from a difficult angle. Ballykelly struggled to get back into the game in the 2nd half, and went scoreless for 15 minutes as the ‘Clough’s pulled away to win by seven.